Hanney Youth FC - Youth football, as it should be! Applications are now open for Hanney Youth FC's 2019 tournament, to be held on 22nd June 2019. Hanney Youth has new teams and welcomes new players - we have Rising Stars, Under 6, Under 7, Under 9, Under 10 and Under 14. See the Team Pages for more details. Grove Geeks are very proud to sponsor Hanney Youth, and to provide IT help and support within the Hanney, Grove and Wantage area. New sponsors are welcome,with sponsorship from just £50 for a website advert. 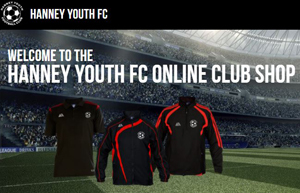 Visit our online club shop to buy your kit.